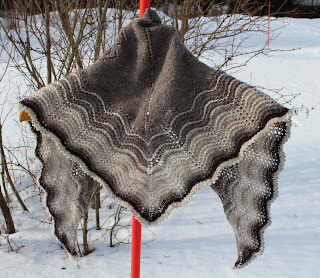 What a beautiful handspun shawl Barbro! I need to get started on my Hap shawl one of these days. Thanks, but there are only a few rows of handspun. 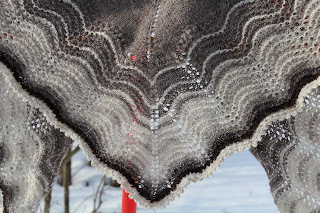 I used the two yarns from Blacker Yarns I showed in an earlier post, the St Kilda yarn. I need to make that clearer in my post. Your shawl is lovely! The colors and pattern all work together beautifully. The addition of light and dark is a wonderful way to remember the coloring of the sheep as well as being an effective design element. Well done!